TinyCo had a big announcement this week as the developer took its first step into licensed games, touting a deal with Fox Digital Entertainment to create a new Family Guy title for mobile devices. Speaking with GamesIndustry International about the move, TinyCo head of business operations Andrew N. Green said the departure from its owned intellectual property (which include games like Tiny Castle, Tiny Mosnters, and Spell Storm) to work in someone else's world--and to collaborate with the people behind the show at Fox and Fuzzy Door--will give the studio a better understanding of how world-class brands are built. When asked if this marked a shift away from working on TinyCo's own IP, Green said work on that front would continue. "We still have a team that's dedicated and working right now on original IP," Green explained. "But for us, it's the quality of that original IP. Could it stand on its own? Could it be a world-class property? Are the characters and worlds we're creating as good as some of the best entertainment properties in the world? We want to be playing at a higher level and building higher quality in terms of characters and worlds. That takes more time, and we want to take more time to do that." Whether it's about creating more original properties or expanding on the ones it already owns, Green said the studio is just one of many in the market who have started to embrace quality over quantity. Whether a game has a license attached or not, the core experience has to be compelling or it's going to have problems. "I don't think quantity and fast follow works anymore, and I don't think it worked that well to begin with, except for a select few." "We believe that focusing on not just your own capabilities internally, but focusing on less and making that better in general is a better philosophy when it comes to games," Green said. "And I think there's a variety of different competitors, whether it's Zynga or Pocket Gems or Storm 8, they've always been about fast follow, or quantity. And we've never made the decision to jump as hard as those guys onto fast following and trying to get more and more games out. In the market, I don't think quantity and fast follow works anymore, and I don't think it worked that well to begin with, except for a select few. I don't think it's a worthy strategy for the future." That philosophy may sound familiar to anyone who's followed the console market and remembers the "fewer, bigger, better" approaches endorsed by the likes of Activision, Electronic Arts, and THQ. But as the mobile market matures, it's not just companies' portfolio management that will begin to resemble their console cousins. Green suggested that the marketing of mobile games is also in for a facelift to the more familiar, especially as discoverability becomes a tougher nut to crack for even established outfits. "I mainly come from a marketing background, and I think the marketing for mobile games is going to move more toward traditional marketing, because that's what's going to create excitement [and] differentiation," Green said. "But it also means the game has to be worthy of that story, because people will be able to sniff out if it's not [high] quality earlier." TinyCo is committed to a marketing campaign 'befitting the premium caliber of the brand'. As for examples of that traditional push, Green said creating better assets, better video, and a better dialog with the core gaming community and other online groups would be key, helping developers to differentiate their titles earlier and grow a base of people genuinely excited for each project. 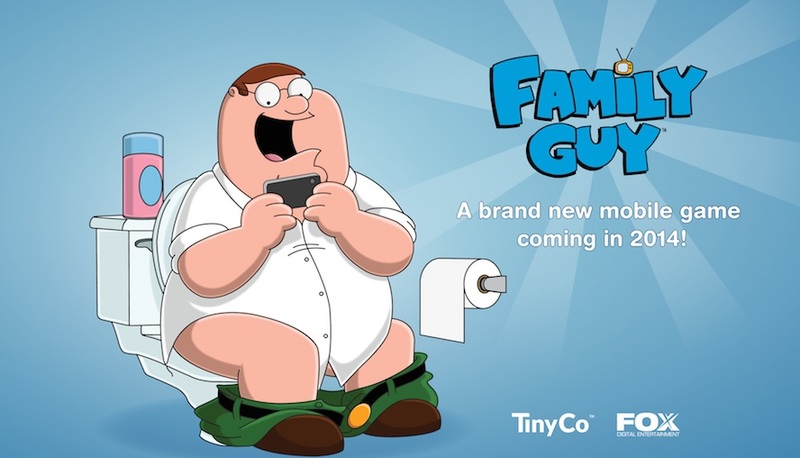 The early announcement of TinyCo's Family Guy game (it has a 2014 launch window at the moment) would seem to be a step toward a more traditional marketing campaign, and certainly one can imagine plenty of old-fashioned TV spots running during the show's numerous syndicated airings, but Green declined to detail how the promotional campaign would reflect his vision of the future of mobile marketing. "We are going to be partnering with Fox to ensure that the ramp up to the Family Guy game launch and ongoing marketing operations are befitting the premium caliber of the brand," Green said. "We are definitely planning some exciting and innovative marketing for the game and looking forward to sharing more soon." Whatever the campaign looks like, it will almost certainly play a critical role in the success or failure of the game. Discoverability is far and away the greatest obstacle to success in the mobile market, Green said, and it's increasingly important not just to build a marketing story around the game, but around the people who create it as well. "Let's say you're a dev the size of TinyCo and you've got something really special," Green said. "How do you penetrate the noise of the market? It's very noisy, not just here on mobile. There's noise everywhere, everything from mobile communications to social networks to film marketing to other products to every different type of game that's out there. You're competing with every bit of time and bit of noise. How you actually break through the clutter continues to be the number one issue for the market." But Family Guy is surely a fast follow of The Simpsons: Tapped Out? Full Fat had their breakthrough with Flick Golf. The they went for licensed products with the NFL brand. Market growing thin with so many apps and products maybe? that happens to everyone after all when players have their priorities. Even people with video-games as their first (and some cases only) main passion get selective after a particular point. So no costumer is going to buy every single app up there.